You’ve heard of paint by numbers? Get ready for feed-the-world by numbers. Dutch agricultural company PlantLab wants to change almost everything you know about growing plants. Instead of outdoors, they want farms to be in skyscrapers, warehouses, or underground using hydroponics or other forms of controlled environments. Instead of sunlight they use red and blue LEDs. Water? They need just 10% of the traditional requirements. At every stage of their high tech process, PlantLab monitors thousands of details (163,830 reports per second!) with advanced sensors to create the perfect environment for each individual type of crop. In short, they create a high tech ‘plant paradise’. See it in action in the videos below, followed by plenty of pics of their tomatoes, cucumbers, peppers, etc. PlantLab’s revolutionary approach to agriculture may be able to leverage math and science to create a better food supply for the world’s escalating population. Fresher, local, more efficient…and they supposedly taste better too! 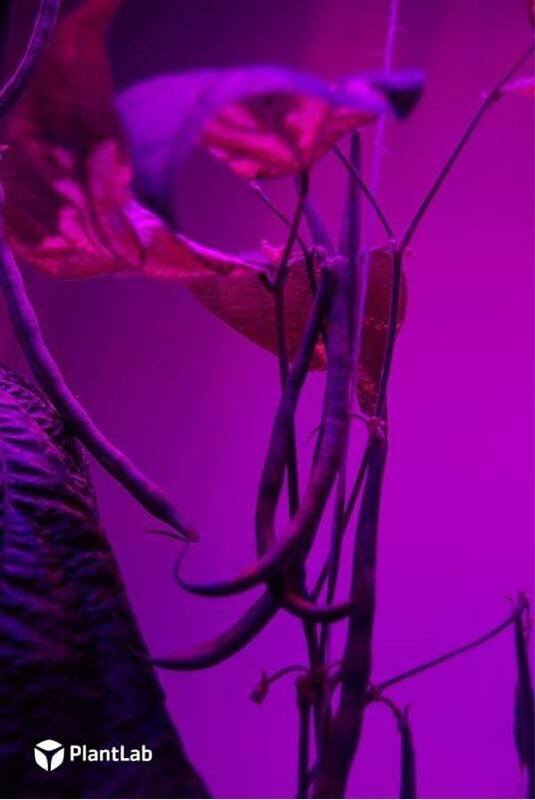 What does PlantLab’s purple fetish buy you? When grown outdoors plant photosynthesis is only about 9% efficient. 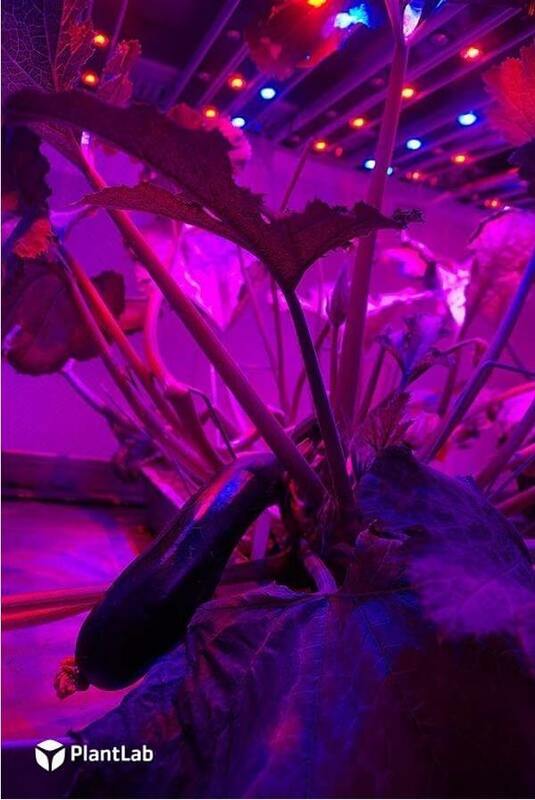 With the correct balance of colored LED light, PlantLab has increased that efficiency to 12 or 15%, aiming for 18%. Double the efficiency means increased yield (or more likely equal yield with less energy). By keeping the plants in a contained system, PlantLab can also recycle evaporated water, which helps them grow crops using just one tenth the water as with traditional greenhouses. Because PlantLab’s harvest is indoors, they don’t have pests (and could quickly isolate rooms that somehow got contaminated) and they don’t need pesticides. Finally, PlantLab’s production facilities can be built almost anywhere: from the Sahara to the Artic, it’s all going to look the same indoors. So everyone’s food can be grown as local as possible. That means fresher food with less costs of transportation. PlantLab is just getting started. 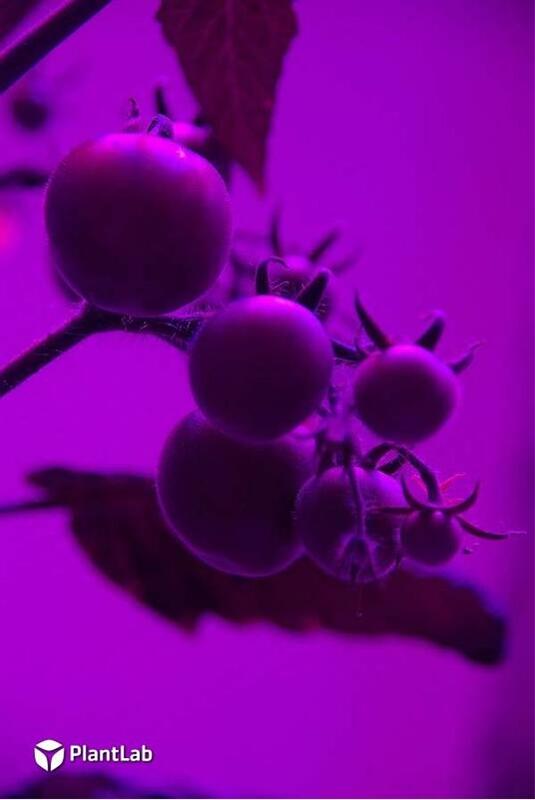 They’ve created unique ‘Plant IDs’ for various crops, essentially providing detailed recipes for how to get each plant to produce food to order. Maybe you want bigger and efficient, maybe you want the best taste – they claim to be able to fine tune results accordingly. They also created a master control program, PlantLab OS, to handle all the feedback from sensors, and control the following environmental factors: light color, light intensity, light color ratios, day length, infrared, light temperature, root temperature, plant temperature, irrigation, nutrition, air velocity, air composition, humidity and CO2. 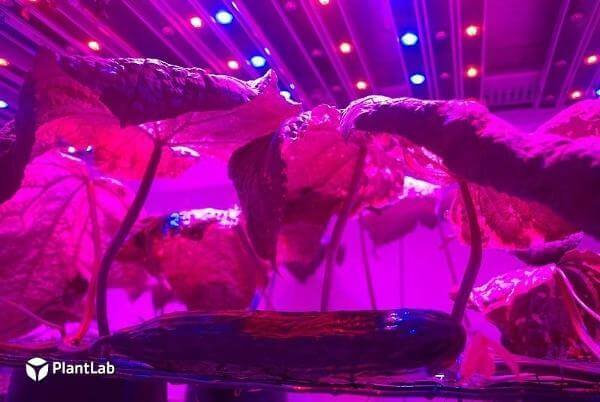 PlantLab worked with Philips to create a unique “far-red” LED to produce a wavelength of light uniquely stimulating to plant growth. Essentially, they’ve done much of the first wave of research needed, and they’re now ready to start building full-scale production facilities on a limited basis. 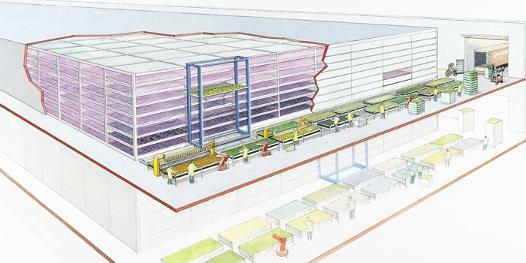 PlantLab’s vision of the future of farms. Data driven crops in controlled environments with automated systems. My goodness, it’s beautiful. But we probably won’t see PlantLab farms springing up around the world for at least a few more years. The biggest reason behind the delay are the LED lights. While cost and power efficiency for these bulbs are following Moore’s Law (essentially doubling every two years or less) they are still cost-prohibitive for commercial agriculture. Meeuws and his colleagues are convinced however, that the price for LEDs will continue to fall exponentially until PlantLab productions are financially feasible. Startup costs (buying buildings, securing water rights, etc) will always be high, but on a case by case basis they can be overcome if energy prices become more manageable. 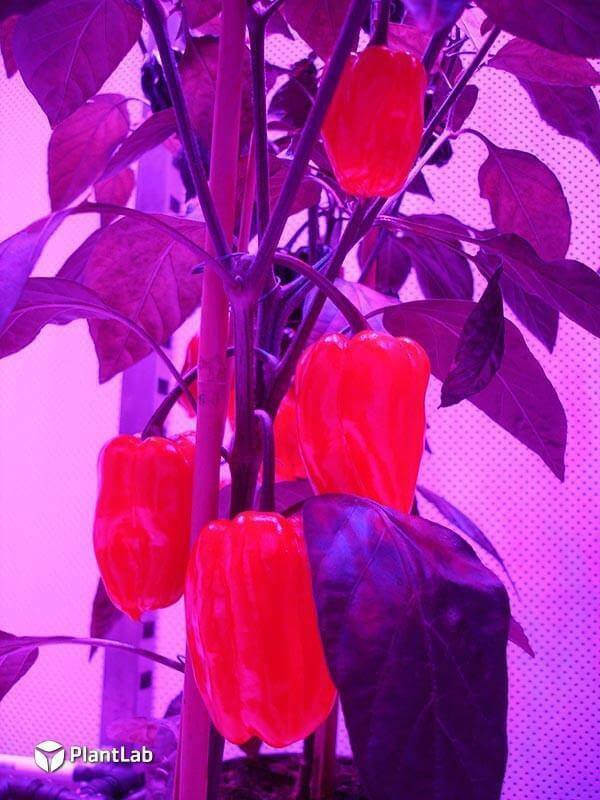 Especially considering the benefits of the produce PlantLab can grow. PlantLab was founded with four key principles in mind, which can be paraphrased as such: 1) if we don’t create a lot more food, our growing global population is going to starve 2) we need to innovate 3)we should redesign agriculture to best suit a plant’s growing needs, and 4) if we can balance all the factors in a plants environment, we can optimize food production. Frankly, the creation of those goals alone would have impressed me. That PlantLab has employed them to such great benefit is truly wonderful. Triple the production of traditional plants on just 10% of the water is amazing. Customized environments to maximize (or tailor) yield controlled by complex operating software? Also amazing. The reduction (or absence) of pesticides and the ability to place these agricultural facilities almost anywhere is amaz—Look, it’s all just pretty freakin’ awesome, okay? Every bit of it. If and when the energy cost hurdle can be overcome, I think PlantLab’s approach to agriculture may be a definitive one for the early 21st Century. Every crop gets its own perfect paradise, and humanity gets local, abundant food for their needs. Math and science can feed the world. Get hungry. Image Credits: © 2011 PlantLab.